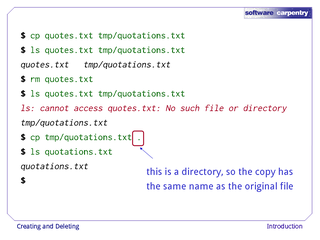 Creating directories and files using mkdir and a simple editor called nano. 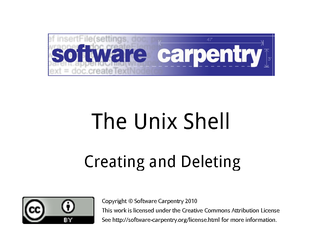 Hello, and welcome to the third episode of the Software Carpentry lecture on the Unix shell. 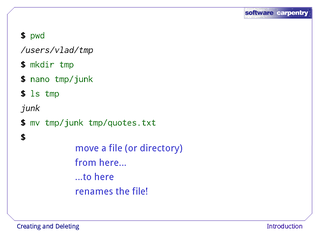 In this episode, we'll see how to create, rename, copy, and delete files and directories. 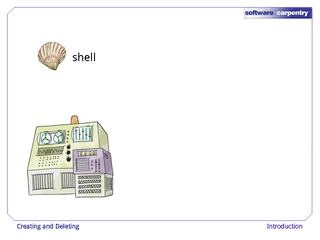 …is through a command-line shell. When we type in commands like these, the shell finds the corresponding programs, runs them on our behalf, and shows us their output. 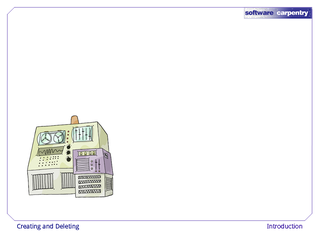 But how do we create files and directories for it to show us? 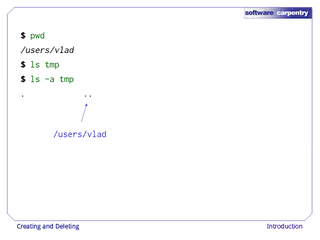 Let's go back to Vlad's home directory, /users/vlad. 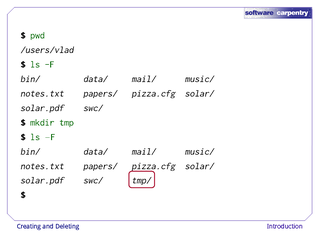 As in the previous episode, ls -F shows us the files and directories it contains, with a trailing slash after each directory to help us tell them apart. 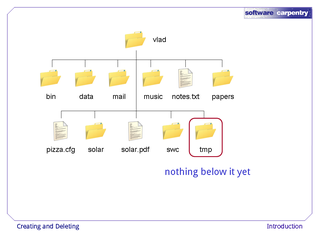 Let's create a new directory called tmp with the command mkdir tmp. 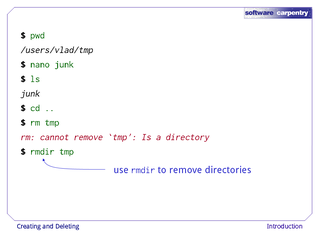 As you might guess from its name, mkdir means "make directory". 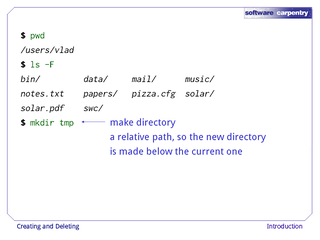 Since tmp is a relative path (without a leading slash), the new directory is made below the current one. 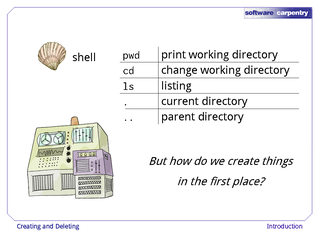 …and created the new directory here. However, there's nothing below it yet: tmp is empty. 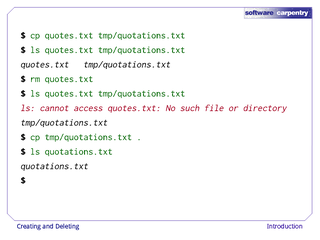 …which we can tell because ls doesn't print any output. If we use ls -a to show directories whose names start with '. ', though, we see that . and .. are there, as they always are. 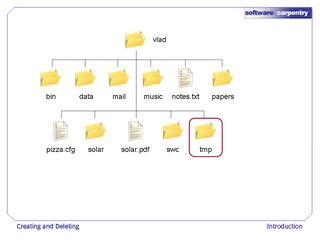 The first name, ., refers to the directory itself, i.e., /users/vlad/tmp. The second, .., refers to its parent, which just happens to be the current working directory /users/vlad. 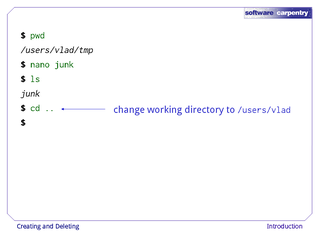 Let's change our working directory to tmp using cd, then run the command nano junk. 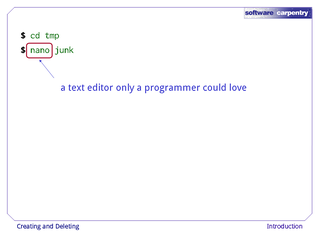 nano is a very simple text editor that only a programmer could really love. 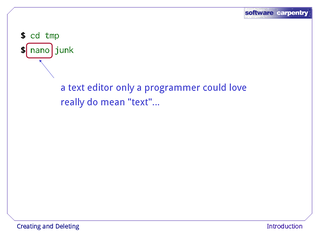 And we really do mean "text": it can only work with plain character data, not tables, images, or any other human-friendly media. This is what nano looks like when it runs. 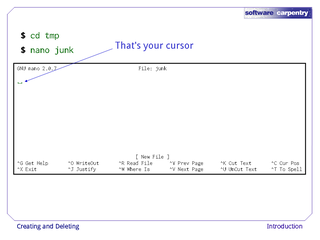 The cursor is the blinking square in the upper left; it shows us where what we type will be inserted. 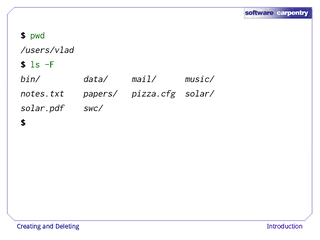 …then use Control-O to write our data to disk. 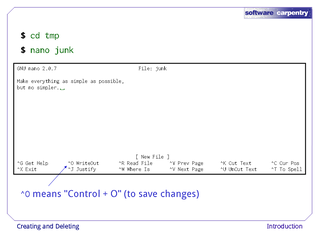 By convention, Unix uses the caret ^ followed by a letter to mean "control plus that letter". 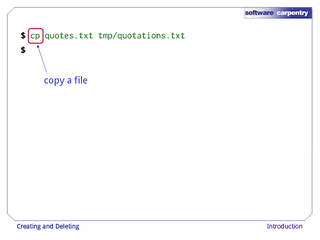 Once our quotation is saved, we can use Control-X to quit the editor and return to the shell. 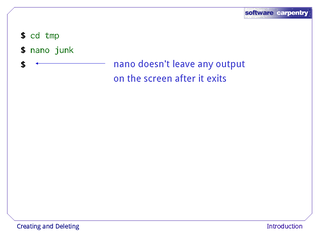 nano doesn't leave any output on the screen after it exits. 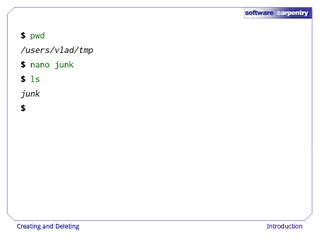 But ls now shows that we have created a file called junk. Running ls with the -s flag shows us how large things are. …which probably isn't the least helpful option imaginable. If we add the -h flag, ls uses more human-friendly units for its output. Here, 512 is the number of bytes the file takes up. This is more than we actually typed in because the computer rounds sizes up: the smallest unit of storage on the disk is typically a block of 512 bytes. 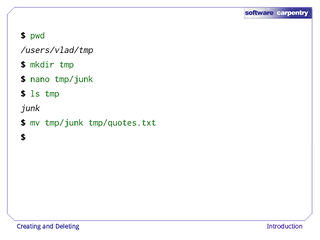 Let's tidy up by running rm junk. 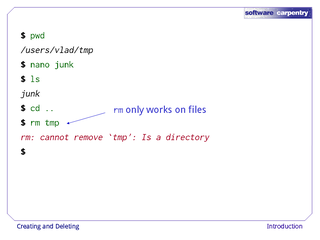 "rm" stands for "remove"—this command deletes files. 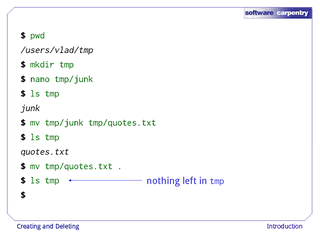 It's important to remember that there is no undelete. 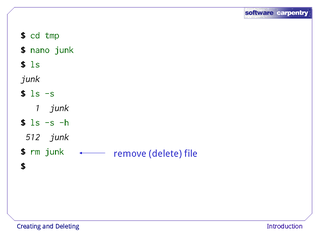 Unix doesn't move things to a trash bin: it unhooks them from the file system so that their storage space on disk can be recycled. Tools for finding and recovering deleted files do exist, but there's no guarantee they'll work in any particular situation, since the computer may reclaim the file's disk space right away. If we now run ls, its output is empty once again, which tells us that our file is gone. 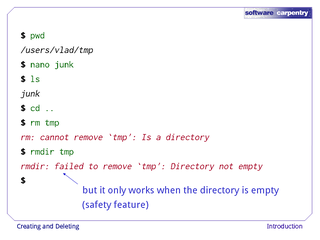 If we try to remove the tmp directory using rm tmp, we get an error message: rm only works on files, not directories. 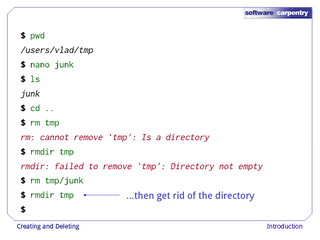 The right command is rmdir, which stands for "remove directory". 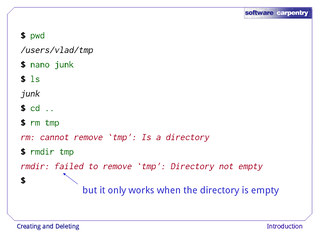 It doesn't work yet either, though, because the directory we're trying to remove isn't empty. This little safety feature can save you a lot of grief, particularly if you are a bad typist. If we want to get rid of tmp we must first delete the file junk. 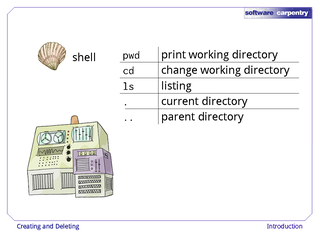 The directory is now empty, so rmdir deletes it. 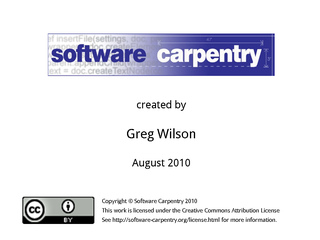 Let's create that directory and file one more time. junk isn't a particularly informative name, so let's change the file's name using mv. 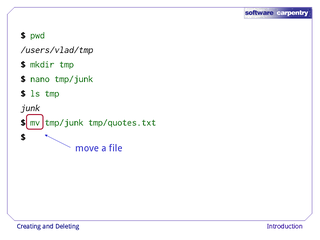 mv is short for "move": we use it to move a file from one place to another. It also works on directories: there is no separate mvdir command. The first argument tells mv what we're moving. The second tells it where the thing we're moving is to go. 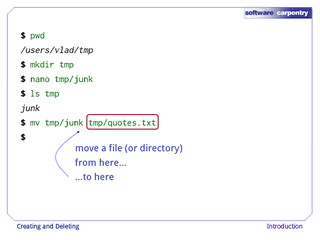 In this case, we're moving tmp/junk to tmp/quotes.txt, which has the same effect as renaming the file. Sure enough, ls shows us that tmp now contains one file called quotes.txt. 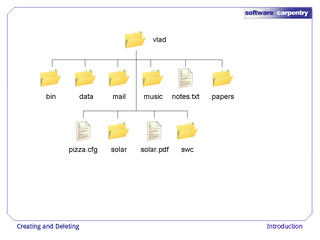 …but this time, the second argument is a directory. The effect is to move the file from the directory it was in to a different directory. 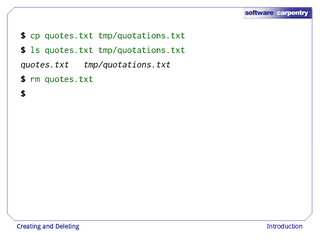 …but we now have quotes.txt in our current directory. 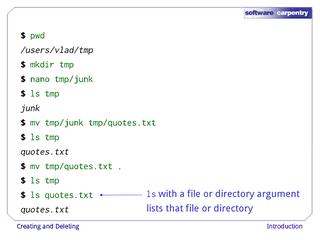 And notice, by the way, that ls with a filename or directory name as an argument lists only that file or directory. 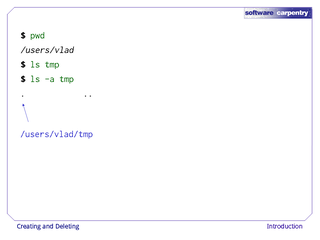 The cp command works very much like mv, except it copies a file instead of moving it. 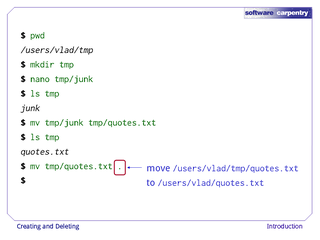 We can check that it did the right thing using ls with two paths as arguments. 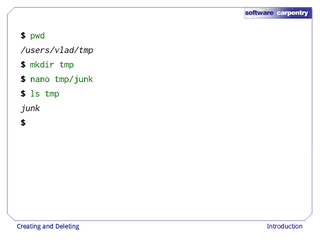 Like many other Unix commands, ls can process up to thousands of paths at once. …and then run ls again. 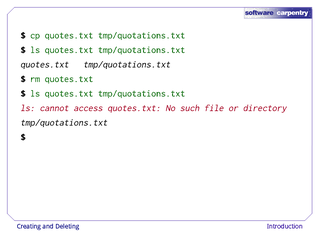 This time, ls tells us that it can't find quotes.txt in the current directory, but it does find the copy in tmp, which we didn't delete. Let's make one more copy. This time, though, we don't specify the destination filename, just a directory, so the copy will keep the original's filename. 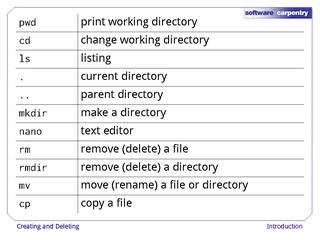 To summarize, here are the commands we've seen so far, along with the two special directory names. 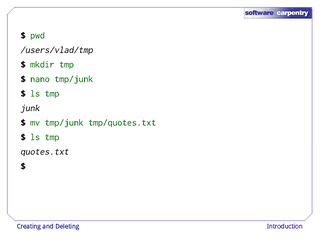 In the next episode, we'll see how to operate on text files using pipes and filters.